Kim Kardashian West tweeted last year that she had made $80m (£62m) from her video game app. Her latest project, ScreenShop, could see her add some serious cash to her tech empire as it's released worldwide. The app, which lets social media users buy what they see in posts, is something Kardashian West says she has "never seen before". It works on platforms like Instagram, Facebook and Snapchat by matching clothes you see on them to the exact items. The reaction hasn't been entirely positive, though, with some bloggers afraid that the app will stop them from earning commission from sales via their own social media platforms. ScreenShop also offers you cheaper alternatives because items on celebrities are likely to be designer or have high prices. The app uses technology to show copies and similar items. This feature is something Kardashian West approves of. "I obviously want to invest my time in projects that I really think people would want and things I haven't seen before," she tells Vogue. "Shoppers are so much more visual and so much more creative than maybe in the past. "I truly think if they see something worn a certain way, if you market it that way and merchandise it that way in the store, people will buy it." Katie Baron, a fashion writer and global head of retail at Stylus Media Group, tells the BBC that Kardashian West's app "means serious business in an era where instant digital gratification is pretty much expected". "It's not quite as seamless as the initial headline may suggest," she says. "You still need to take a screenshot, upload it, scour through the various options and then be redirected to a retail website to buy. "But it's possibly one of the best tools to date for translating the power of social media, driven by a youth sector who talk a largely visual language, into cold hard cash. "Brands, of course, just have to hope that these social media fashion fans don't always go for the budget option, or that there's a way within the app to surface their products. Without that, many brands will be left in the cold." ScreenShop has struck commission deals with big name brands ASOS, Topshop, Boohoo and Forever 21. These companies will provide a databases of items and better matches of clothes, but other retailers' items will still be featured as part of search results. 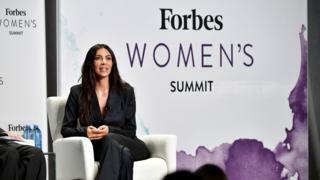 Kardashian West and the tech creators she has built the app with will make money by taking a small slice of the sales made on the app. This is where it gets complicated, as the app could cause all sorts of problems for bloggers and influencers. That's because many of them already have their own system in place, which gives them a commission when their followers buy clothes they post online. Em Sheldon is a blogger and Instagram influencer with an online following of more than 100,000 users. One of the ways she makes money is through affiliate links, which are clickable links that take you to buy the clothes she is wearing. She earns a small commission from the sale, but it doesn't cost the shopper any more than if they would have found the item on their own. She tells the BBC: "A blogger is a personal shopper for you, you pay absolutely no more money, sometimes the blogger will have a discount code for you or scout out the best deals. "We make a tiny percent [of the sale price] for a lot of work - finding constant sales, which benefit the buyers. "Bloggers spend thousands on clothes and make absolutely no money so making 10p per sale is nothing to the customer but helps the blogger." She says ScreenShop stops a key revenue stream for bloggers because instead of them clicking on their links, followers will simply use the app to find out where bloggers' clothes are from. "[Kardashian West] is monetising our content and making money out of our fashion sense and style," Sheldon says. Other bloggers have agreed, including influencer Lydia Millen, who posted on Twitter that the app "can't be fair". The system bloggers use to make money from their outfits is an app and website called LIKEtoKNOW.it, made by the company rewardStyle. The app shows the exact clothes worn by bloggers on their own websites and social media, and also has its own section to shop screenshots too. RewardStyle's co-founder Amber Venz Box tells the BBC she finds Kim's app and use of technology "flattering". "Imitators like this only further confirm what we know well - consumers are inspired by influencers and they want to shop their looks," she says. Venz Box says what separates ScreenShop from LIKEtoKNOW.it is that her company pays bloggers commission, which Kardashian West is not set to do. Venz Box's app compensates bloggers based on how many items they help sell and how much they cost. "I created rewardStyle in 2011 as a solution to monetise my fashion blog and today, rewardStyle provides monetisation to 20,000 hand-picked influencers through a global technology platform," she says. Katie Baron acknowledges the appeal of apps like LIKEtoKNOW.it, but likes the fact ScreenShop turns any image into a "shoppable inspiration" rather than just being the photos from an "elite band of influencer bloggers". "This could effectively democratise the system once again, which is fantastic, with so many bloggers having transitioned from a point of genuine excitement to little more than new generation advertising space," she says.